Great Steel & Metals is the most acclaimed manufacturer, exporter, distributor and supplier of industrial ASTM B151 Cupro Nickel Tubes 70/30 with required test certificates. You can also Order small quantities, we will be happy to quote best price for small and large quantities & can typically deliver the ASTM B151 Cupro Nickel Tubes 70/30 in minimum time frame anywhere around the globe. Description: 70/30 Copper Nickel Piping Tubing available in 1/4″ to 12 3/4″ diameter from stock. Length as specified by client. 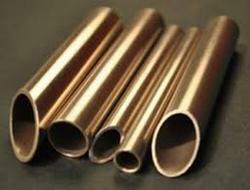 Description: 70/30 Copper Nickel Condenser Tubing available in 1/4″ to 1″ diameter from stock. Length as specified by client. GREAT STEEL & METALS is the most acclaimed manufacturer, exporter, distributor and supplier of industrial ASTM B151 Cupro Nickel Tubes 90/10 with required test certificates. You can also Order small quantities, we will be happy to quote best price for small and large quantities & can typically deliver the ASTM B151 Cupro Nickel Tubes 90/10 in minimum time frame anywhere around the globe. Description: 90/10 Copper Nickel Piping Tubing available in 1/4″ to 12 3/4″ diameter from stock. Length as specified by client. Description: 90/10 Copper Nickel Condenser Tubing available in 1/4″ to 1″ diameter from stock. Length as specified by client. We supply ASTM B151 Cupro Nickel Tubes 90/10 to Oil & Gas, Refineries, Fertilizers, Heat-Exchangers, Paper & Pulp, Pharmaceuticals, Chemicals, Water Treatment, Dairy, Sugar & Food Processing, Construction, Mining, Shipbuilding, Offshore, Defence, Ports, Railway, Nuclear Power, Power Plant, Cement, Government Org., Engineering Co., Oil Mills, and other industrial projects. Looking for Cupro Nickel Tubes & Pipes ?